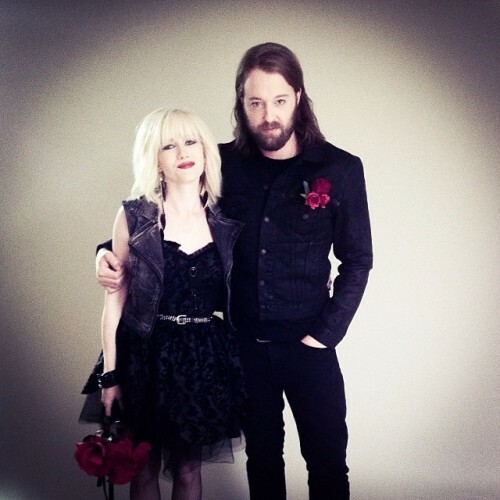 The first images from the set of If I Stay via their tumblr show Mireille Enos as Cat and Joshua Leonard as Denny, Mia's rocker parents in their wedding photo. Since my first "If I Stay" post in August, the screen adaptation of Gayle Forman's popular YA thriller starring Chloe Grace Moretz and Mireille Enos has gotten underway; the film started shooting last week in Vancouver. Answering our remaining casting questions, the roles of Mia's rock n' roll boyfriend Adam Wilde will be played by Jamie Blackley(“Snow White and The Huntsmen”), Liana Liberato (Stuck in Love) has been cast as 'her sharp and sarky best friend' Kim Schein, her little brother Teddy —who may or may not have died in the accident— will be played by Jakob Davies, a pretty cute young Canadian actor who is also playing young Hector in the screen adaptation of Hector and The Search for Happiness. The role of Mia's rocker dad Denny Hall, will be played by Joshua Leonard, seen above with Enos in one of the just released production photos. Fingers crossed they'll continue to share! R.J. Cutler ("The September Issue," “Nashville”) directs from a script by Shauna Cross (What To Expect When You're Expecting). John DeBoorman (An Education, Serendipity, Half a Yellow Sun) is the cinematographer. "The film follows Mia (Moretz), who at age 16 has everything: a loving family, an adoring boyfriend, and a bright future full of music. Suddenly, a family drive on a snowy day changes everything. In an instant, almost all of that is taken from her. Caught between life and death, Mia spends one critical day contemplating her destiny, which is now more unknowable than ever. Is her soul mate’s love enough to keep her here? Tragic but ultimately hopeful, this is a romantic, riveting and uplifting story about music, life and love." You can follow Foreman on twitter at and at her Tumblr "Gezellig"
Follow the filming with me?